1. Don’t ever wear your jeans/trousers at your chest even if you might be the short-body-long-legs kind of guy. It is repulsive. Your pants should be worn at or below your navel. Any higher, and they aren’t pants. 2. Chest hair gazing out of a V-necked T-shirt is not macho: A simple trick is to avoid V-necks if you have too much chest hair. Else remove chest hair completely before you wear them. 3. Paunches are OK as long as you don’t over-emphasize them and there are many ways to camouflage. A loose fitting shirt (in or out) would do that nicely. 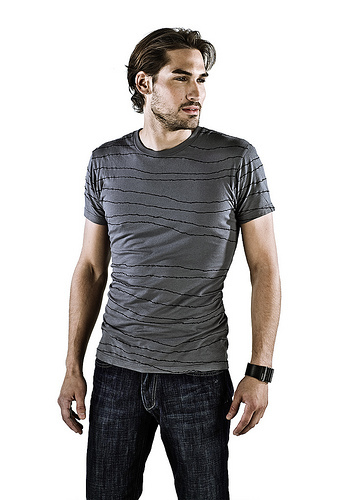 If you still feel better wearing a T-shirt, wear a collared one in a dark shade which is a size larger. It works. 4. Shirts are shirts and should be shorter than dresses: When you wear a long shirt, be sure it ends at or just below your back pockets, or else it’s a dress. 5. Belts and wallets should always be leather and definitely not the rexine version. Invest in one good brown and one black belt and a good quality wallet. It will last years. 6. Sagging socks are much worse than sagging breasts, because the former is your own doing. When your socks sag, throw them away, even if you think no one notices, everyone does. 7. Rainy sandals and shoes are so gauche even if they are made by Nike. Rainy shoes are for school, and no grown up man should wear them. 8. Don’t get caught with an umbrella except in a definite downpour and here I must qualify what a downpour is – anything less than 24 inches of rain is not a downpour. So dart across if you must, call a cab to your office building, smoke a cigarette while waiting for the rain to calm down, but please don’t be seen with an umbrella on a bright sunny day or when the drizzle won’t wet your cigarette. 9. Jeans should always be blue. Or black at the most. And unless you are absolutely sure, do not experiment with color. Grey and brown, fall under miscellaneous, unless they are corduroy. 10. Do not iron your jeans, and if you really must, please iron then flat and not at the crease. 11. All experiments with color has to be done on your shirts. Not your handkerchiefs. Not your hair. And certainly not your shoes and socks. 12. White shirts are good if you can keep them white. And better if it is linen and you have no breasts. 13. Floaters are for the beach and don’t look perplexed when a high profile club denies you entry because you wore them. 14. Pleated trousers belong to your grandpa and you should never be seen in them, even if nothing has been ironed or you have a terrible laundry crisis. 16. All clothing should be natural fiber. While a bit of Lycra might work on men with six packs, polyester and nylon are non-options. 17. Your belt and your trousers/jeans should not have a tug of war, rather they should seamlessly co-exist. And by this I mean that your belt should never be worn in such a way that your jeans or trousers bunch up. Either the belt is wrong or your adjustment index is. 18. Please, don’t get your jeans altered: If your jeans are too long, let them fray, or fold them, or just cut them off. But please don’t alter them. 19. If you wear labels, let them be real. No fake labels. Follow these tips and remember that women are driven visually too to men who are fashionably perfect and with the right amount of nice looks, just as men are towards women. Women like a bit of aesthetic in their romance, or even in a guy they are having a casual date or dance with. Love the leather belt and shoes tip!! Now I know my hubby is truly styling, as he follows this exact advice!! More men need to read this! Ha. Thanks for the follow, I think your blog is great. It would be perfect to post on our site Upficial, which is a free platform for people like you to get recognized. We value what you do and we think others would appreciate it too. Oh, brother. Gentlemen, find your own style, wear what you love. As long as you don’t dress too over the top, look sloppy or dirty, you’ll be fine.